‘Twas a successful year for one of Apple’s bread and butter – the iTunes store. And to reminisce on what has happened this year, here comes an early treat from Apple – iTunes Rewind 2009.
iTunes Rewind 2009 lists down the bestselling iTunes content – be it apps, music, movies, podcasts and other mobile content available at the iTunes store. Music and movies are ranked according to sales and downloads, while apps are categorized into games and apps. 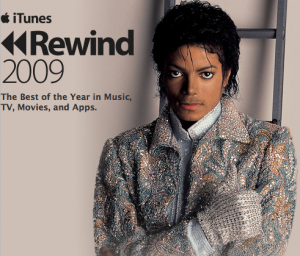 So, if you’ve been an avid iTunes user the whole year, iTunes Rewind 2009 is definitely a list worth checking out for you. On with the list – best games of 2009 at the iTunes Store include the likes of Spider, Real Racing, Zenonia and Ravensworld, while top selling games of 2009 include SIMS 3, Oregon Trail, Need for Speed Undercover, and Madden NFL 10. The last two games are definitely a must have for every iPhone gamer. For Best Apps of 2009, Reel Director, Magellan Roadmate and I Am T-Pain are some of who made it into the list, while top selling apps include the likes of Mobile Navigator America, MLB.com and Textfree Unlimited. Top selling movies at the iTunes Store for 2009 include the likes of “Twilight”, “Star Trek” and “Up”. Check out iTunes Rewind 2009 here.